This car is one of Cadillac’s finest, no doubt about it. It features, as cited above, a 3.0 liter v6 engine that puts out about 265 horsepower, a scale-back from the vehicles cousin… the 320 hp Northstar V8. This car features a 6 speed, automatic transmission, and the same drive train as the Chevrolet Equinox. But this is where the commonalities end it seems between the SRX and the Equinox, as they are two very different and separate vehicles. The interior of the SRX, which is capable of seating five, is beautiful. It is at least on par with anything out there today, if not better. The pearl-nickel chrome accenting hardware, which is hewn about with bits of elegant walnut trim, make the inside of this vehicle look magical. The leather seats are comfortable and beautiful, making it an interior to remember. You can order an optional road-sized tire, but this vehicle sports an electric inflator for those troubling, road side fixes. If you leave it out, you will have a lot more room to haul other stuff in it, especially once you fold down the seats in the back. You can even fit a sheet of plywood in it! The car is amazingly quiet, even when cruising at 70 miles per hour. It is even quiet at idle, only about one decibel louder than the RX350… Which is amazing. Basically, Cadillac has a winner with this vehicle. Seeing as how this is one of the best selling vehicles in the Cadillac lot, it might be the one that needs to carry them through the thick and thin of a struggling motor-company crisis. 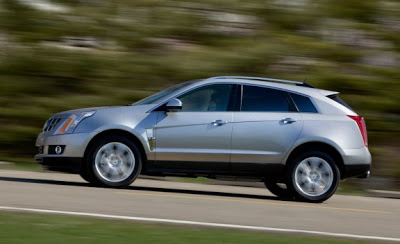 With so many motor companies in trouble, it seems that perhaps Cadillac has it figured out with the SRX.